This weeks wearable electronic DIY project introduction is not very challenging on the eTextile part but it is one of the most outstanding projects I have seen around the interactive glove topic. The Atlas Gloves, created by Dan Phiffer and Mushon Zer-Aviv at the ITP – NYU, act as a physical interface for controlling 3D mapping applications like Google Earth but the available documentation and software is highly hackable and can be modified to act like a mouse input device. 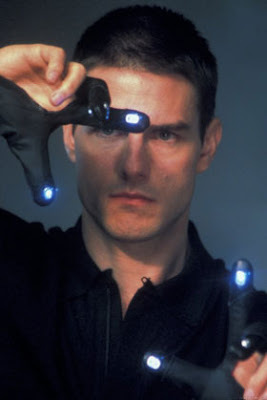 The user/computer interface is a pair of illuminating gloves which track intuitive hand gestures like grabbing, pulling, reaching or rotating. A simple web-cam attached to a computer translates each LED-enabled gesture into a set of possible actions: pan, zoom, rotate and tilt. The video tracking functionality is written within the Processing programming framework, in conjunction with Java’s java.awt.Robot library. This robot library converts a special video tracking vocabulary into mouse clicks/releases and cursor movement in order to control the computer. 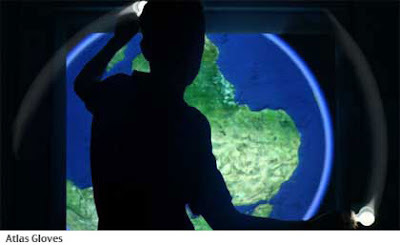 This basically allows to use the light tracking function to use gesture control for a wide range of computer applications, like presentation, photo viewing, Goolge Earth or games. The Open Source Atlas Gloves application can be downloaded at the Atlas Gloves project Website on which you will also find a complete overview with step-by-step guide how to make the gloves. Although the Atlas Gloves project was made in 2006, Dan and Mushon still check the forum and follow up on reader questions via the comments on their site. We're not an expert but reading through all the infos it does look fairly simple, thanks to the excellent project documentation and ready to use software code, to rebuild the 3D gesture interface gloves. Moving objects around on the screen by waving with a hand is so cool, so like Minority Report style, the trend setter in computer interaction.